I hope by now you gals know that I only post about things I use and truly love on here! I’m not paid to write about any of the products I feature. With that being said, you need to go buy this conditioner. My hair is almost always parched (frizziness being a nasty side effect of dryness), but this conditioner has been a lifesaver. I used to just leave it in for a few minutes in the shower and then rinse it out. Ever since moving to San Francisco, however, I’ve upped my game and I’ve started using as a leave-in conditioner. It’s perfect for dry, damaged, color-treated strands and doesn’t leave a heavy or greasy residue. 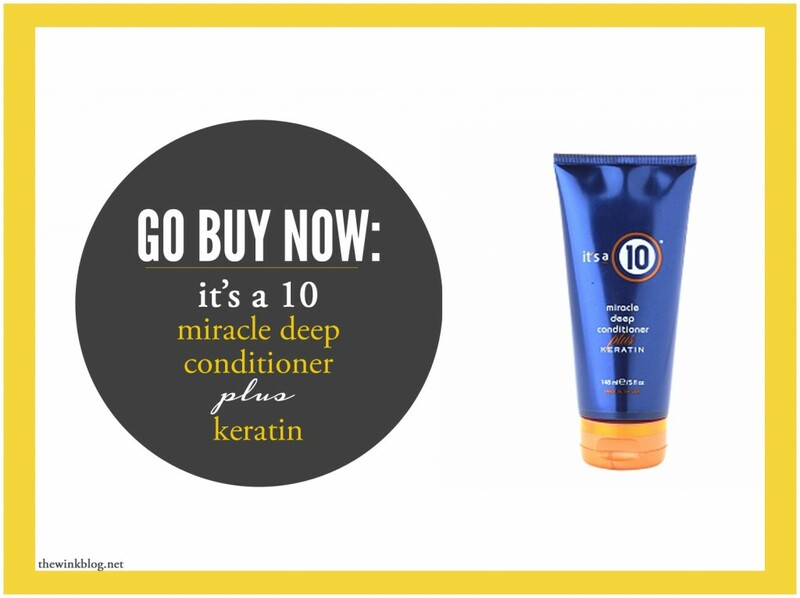 If you’re looking for a heavy-duty WORKHORSE of a hair product, this conditioner is it. It also smells delicious… I consider that a bonus ;). P.S. You also need to go buy this hair cream and this eyeshadow palette. I feel like there’s a fine line between looking fresh-faced and looking too “done.” In my opinion, it’s all in the products you choose to use. This is my usual weekend makeup routine when I’m running around town! This tutorial is for those days where you want to feel put-together but not overly made-up. 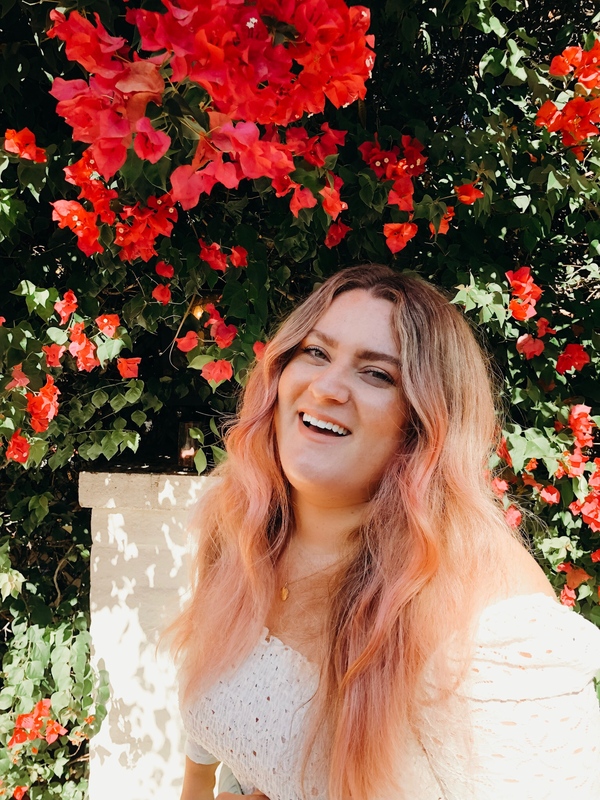 Keep reading for step-by-step directions below (including my product recommendations)! Start with freshly cleansed and moisturized skin. I like to cleanse with my Clarisonic and moisturize with Shiseido Pureness Moisturizing Gel-Cream. Apply a BB cream to your entire face, focusing the majority of the product on your forehead, nose, upper cheeks, and chin. Use your fingers to sheer it out towards your jawline and hairline. I like M.A.C. 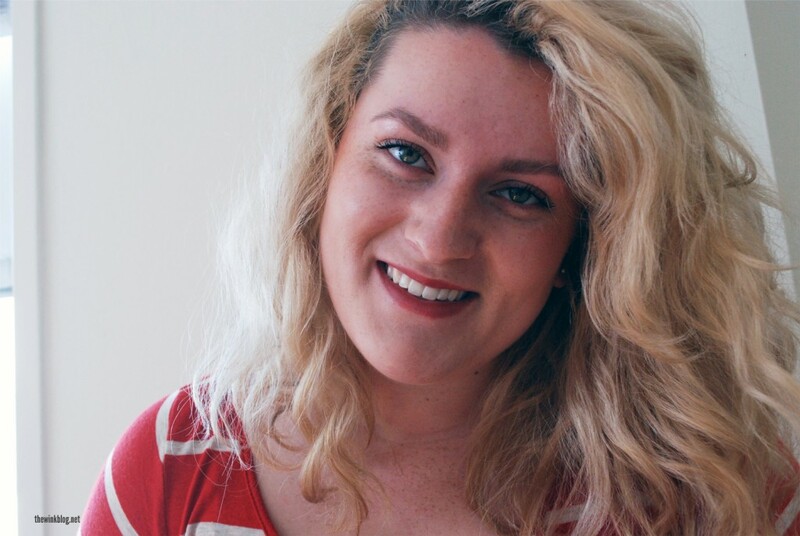 Prep + Prime BB Cream because it evens out my skin tone without covering up my freckles. Using a large, fluffy powder brush, apply a non-shimmery powder bronzer to underneath your cheekbones, temples, hairline, jawline, and down the bridge of your nose. 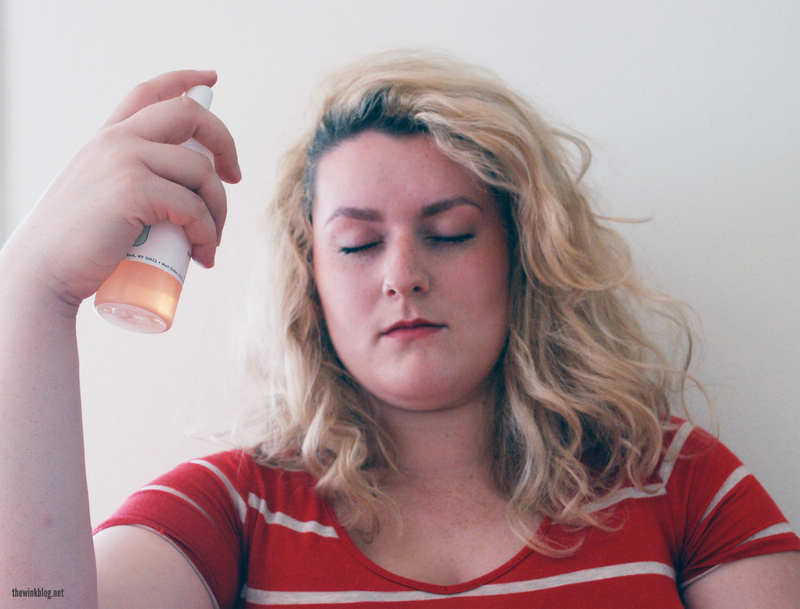 Make sure to gently blow off excess product before touching it to your face. I use NYC Smooth Skin Bronzer in Sunny. Apply a peachy-gold highlighter to your cheekbones, hairline, browbone, and down the bridge of your nose. I’m obsessed with Mai Couture Highlighter Papier in St. Barts. Tame and lightly define your brows with a fiber gel like Benefit Gimme Brow. 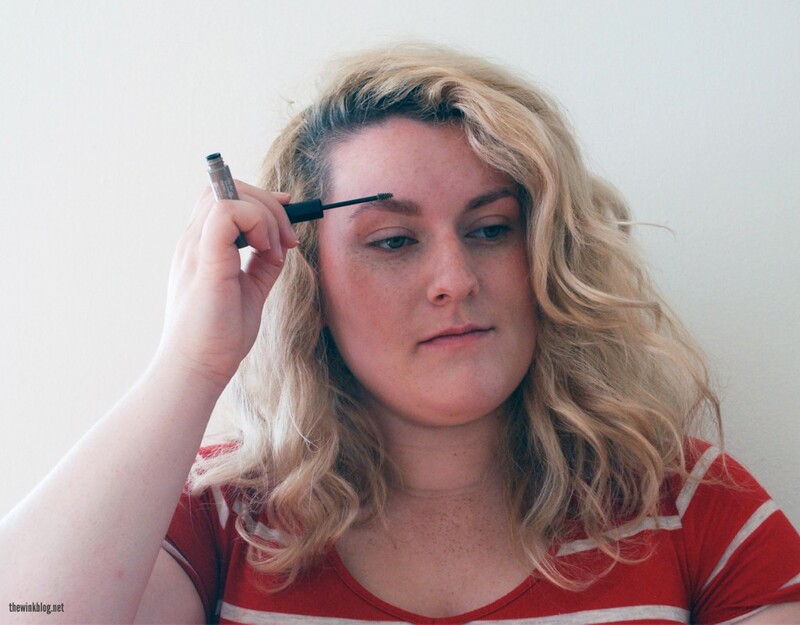 It adds thickness and volume to your brows while still making them appear very natural. Curl your eyelashes. I recently upgraded my drugstore eyelash curler to this one from Shiseido and WHAT a difference! 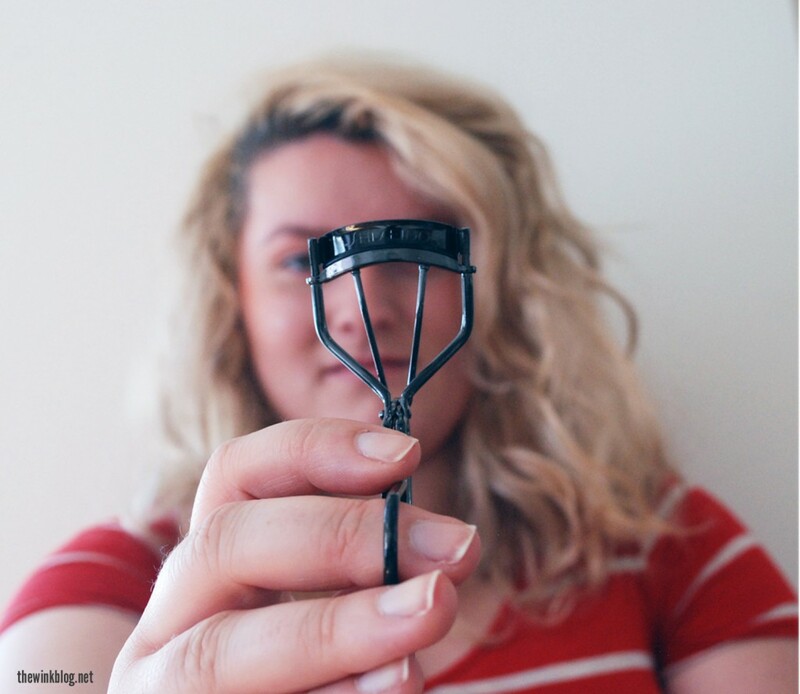 No more weird crimped lashes in the corner of my eyes and my lashes stay curled all day! Apply a defining mascara. I really like Maybelline Great Lash Lots of Lashes because it gives definition and length without looking clumpy or fake. Slick on a lipstain. I just recently discovered Clinique Almost Lipstick in Black Honey and it’s become my go-to product. Just the tiniest bit gives the most gorgeous, natural stain which lasts all day. It also looks good on everyone! TRUST. Set everything with a facial spray like Mario Badescu Facial Spray with Aloe, Herbs, and Rosewater. 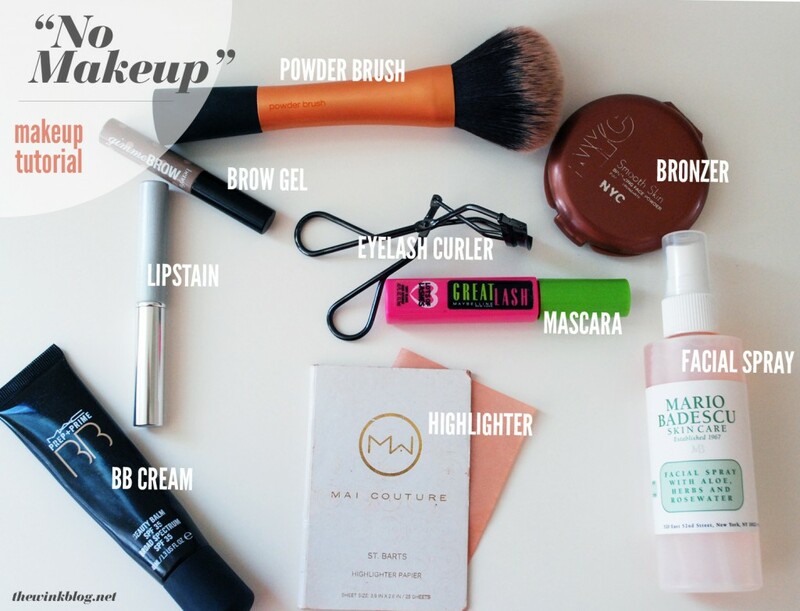 It gives your makeup staying power and still allows everything to look glowy and natural (instead of powder, which can look mannequin-esque). I’d love to know what your “no makeup” makeup routine consists of! Does it looks anything like mine? P.S. 9 steps to your daily flawless face. 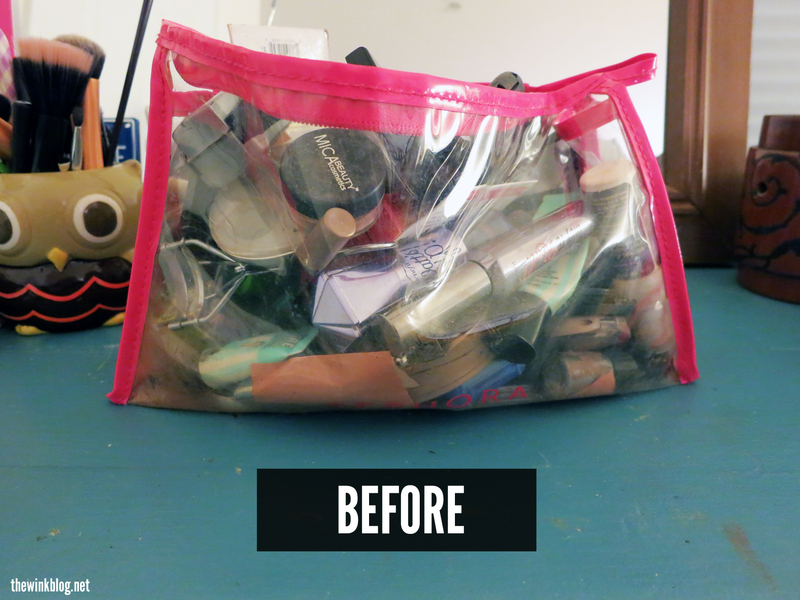 I remember the day I bought my old makeup bag at Sephora. I was thinking that since it was clear plastic that it would help keep me organized and I’d easily be able to find things in it. HA! As you can see from the sad, heaping mess below, that was hardly the case. When I finally cleaned it out, I found good, expensive, barely used products in the bottom that hadn’t seen the light of day in months. What? I desperately needed a new system. I did some research online and found what turned out to be the best makeup organization of my life! Check out the before and after pictures below. The solution (yet again) came from Ye Olde Container Store. 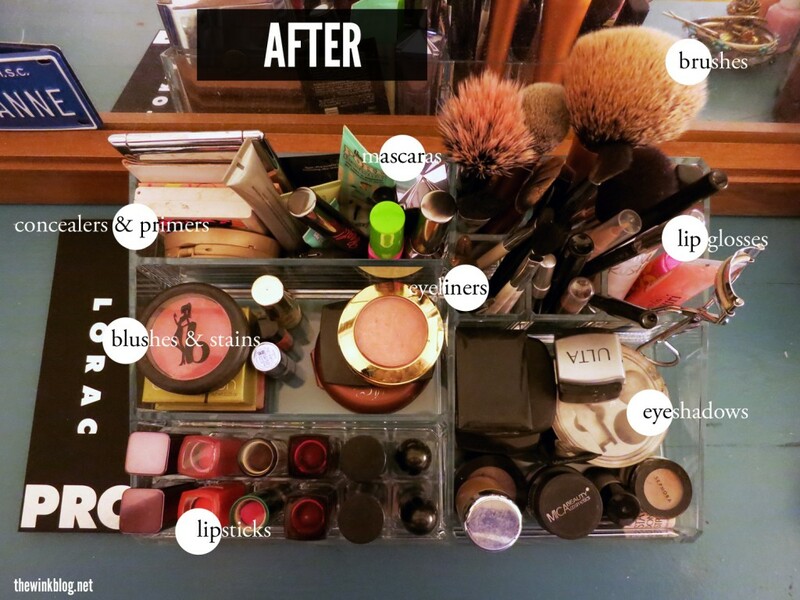 I bought the Large Acrylic Makeup Organizer. 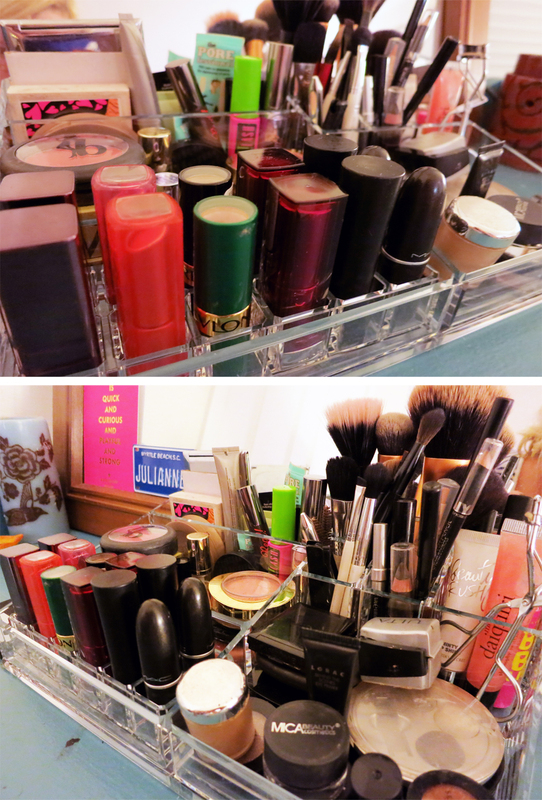 It is large enough to hold my entire makeup collection (yup, it holds a lot more than it looks!) and still manages to look sleek on my dresser. I’m so happy to be able to see ALL of my makeup at once without having to dig through a messy bag. The saying “out of sight, out of mind” applies here, especially to me. I’m rediscovering old favorites that had gotten buried beneath the clutter of my old makeup bag. What are some of your organization tips? P.S. 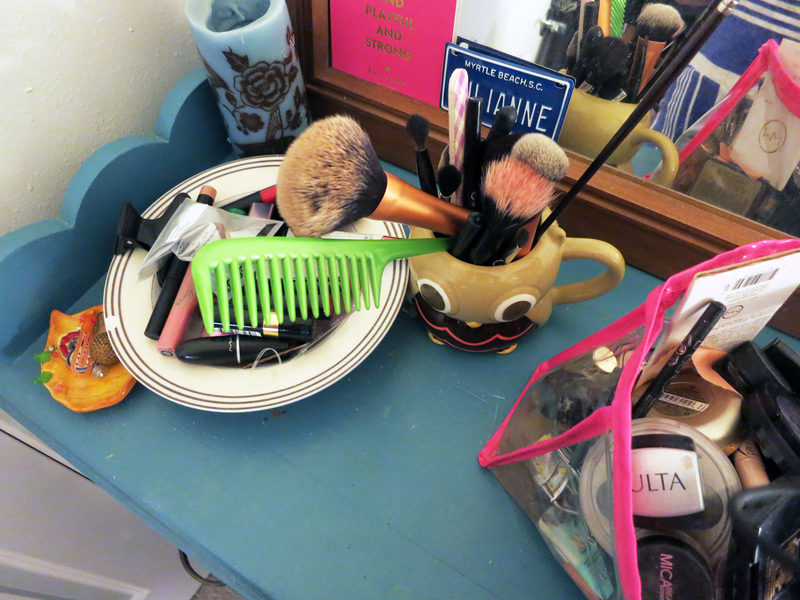 How to organize your bathroom. Is there anything more lovely than receiving a beautiful, handwritten card in the mail, sent with love by someone who cares about you? Yet thoughtful gestures like this quickly fall by the wayside when life gets busy. After all, getting to the post office is a hassle and email is faster, easier, and more efficient. Sitting down and handwriting a note to someone, however, conveys to them that they are worth your time. Try taking a few minutes this week and handwriting a thank you note to that friend who helped you move, to your coworker who covered your shift at the last minute, or to your parents for all their continued love and support. Genuinely and sincerely thank them. Don’t exaggerate or lie about the grandeur of the gift or gesture, as it will come across forced. Try to maintain the same tone on paper as you would in person. It’s okay to show some personality! There’s no need to sound formal if you’re close with them. Write about why you appreciated their gesture. If it was a gift, let them know how you plan to use it. If it was their time, explain to them how valuable it was to you. After writing about yourself, ask about their life in a personalized way. Don’t just ask, “How are you?”. Rather, ask, “How was your vacation to Greece?” or “How’s the new puppy settling in with the family?”. Before ending the note, sincerely thank them again. This reinforces how truly grateful you are for their gift. 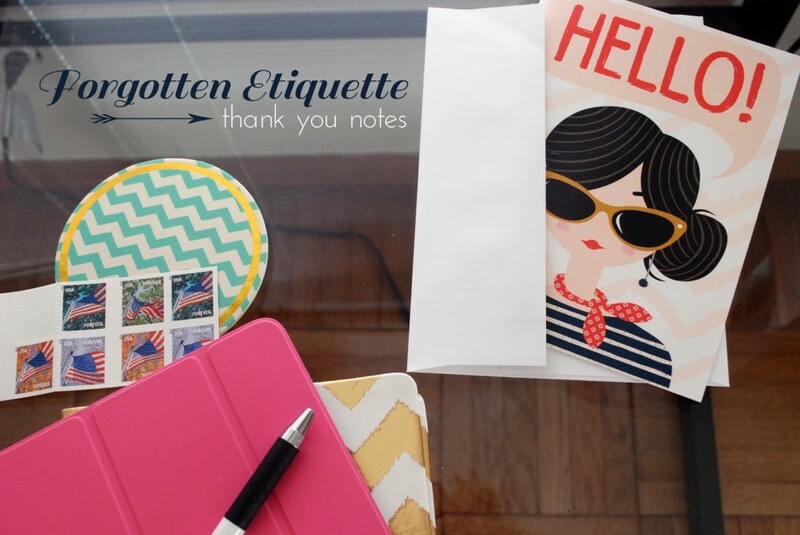 Us modern gals can bring back the forgotten etiquette of thank you notes! Now where did I put my feather quill and ink well…. P.S. 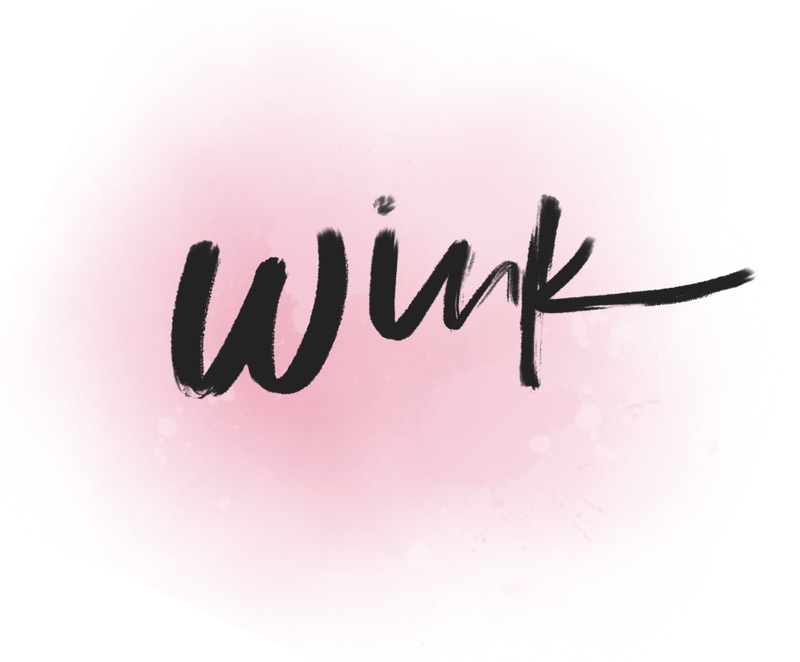 In case you didn’t notice, The Wink got a makeover! A special THANK YOU to my wonderful brother (computer whiz extraordinaire) and fantastic friend, Meghan, (graphic design genius) for making it happen! Things I’ve Learned About Living in SF (part II)! The weather is EXTREMELY hard to dress for. The other day when I left in the morning for work, it was raining/misting/foggy/overcast, so I wore my Bean boots, a trench coat, and brought my umbrella and a pair of flats to wear while at work. Walking to work I got kinda sweaty… yet it was still chilly and everything on me was damp. When I left work at 4:30, the sun was out and it was bright and hot. 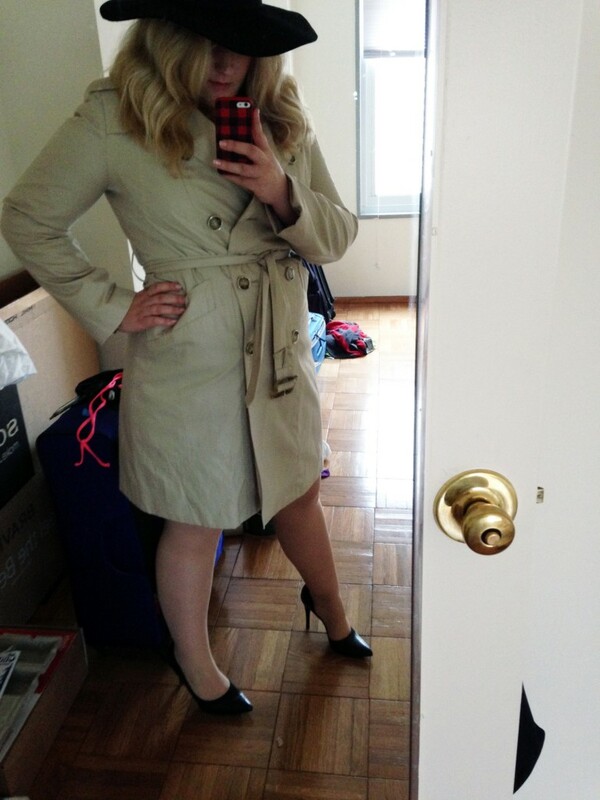 I was forced to lug my Bean boots, large purse, and strip off my cloying trench coat because it was so warm. I literally have to carry an entire change of clothes with me everywhere I go! My alter ego: Jan Sanfrancisco. Wore this to a job interview last week (foolishly) thinking the hat would keep my hair dry. I was wrong. Craigslist is awesome. I spend most of my time these days trolling around on Craigslist. I’m searching for furniture, for jobs, for you-name-it. There’s tons of people selling tons of awesome stuff for really low prices. We’ve practically bought half our furniture from it for super cheap! A lot of the stuff is brand new or lightly used, with good brands like West Elm, Pottery Barn, Crate & Barrel, and CB2. I’m telling you, Craigslist is where it’s at in SF! 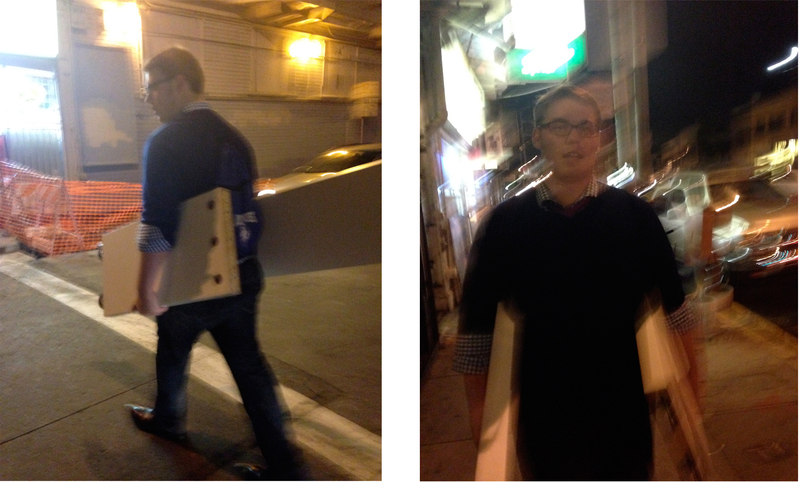 This is what moving in the city looks like at night. My handyman to the rescue! My hair doesn’t know what to do with itself. 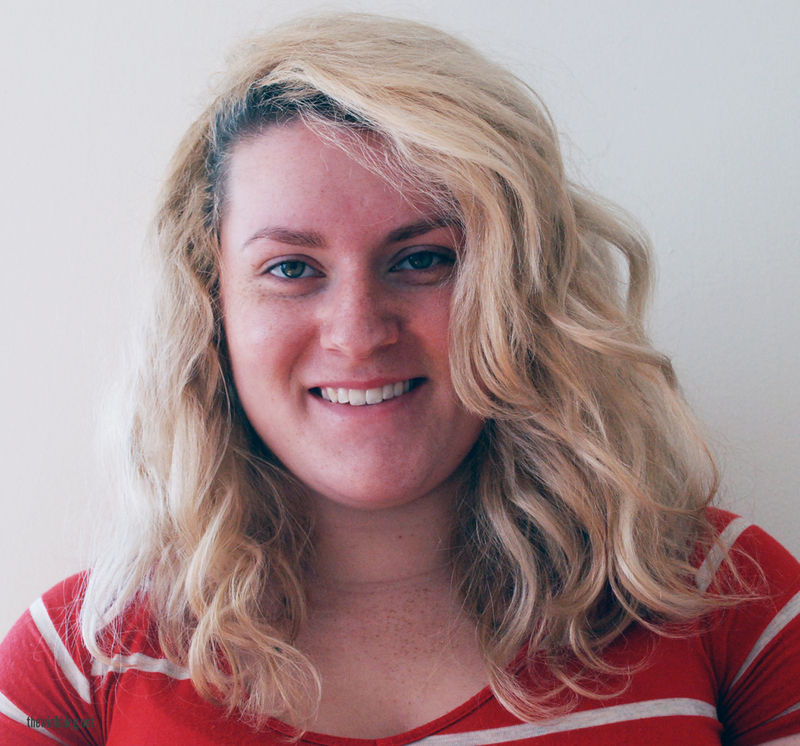 As a naturally curly-haired girl, I’ve gotten pretty good at taming my hair over the years. However, with the aforementioned drizzly/misty/foggy weather, I am constantly looking like a huge frizzy mess. I haven’t found a hair product yet that can stop me from looking like Ms. Frizzle! If you SF gals have any suggestions, I’m in desperate need. It’s becoming a real problem. I’ve had to resort to wearing my hair up most days. Help! Lipstick: M.A.C. 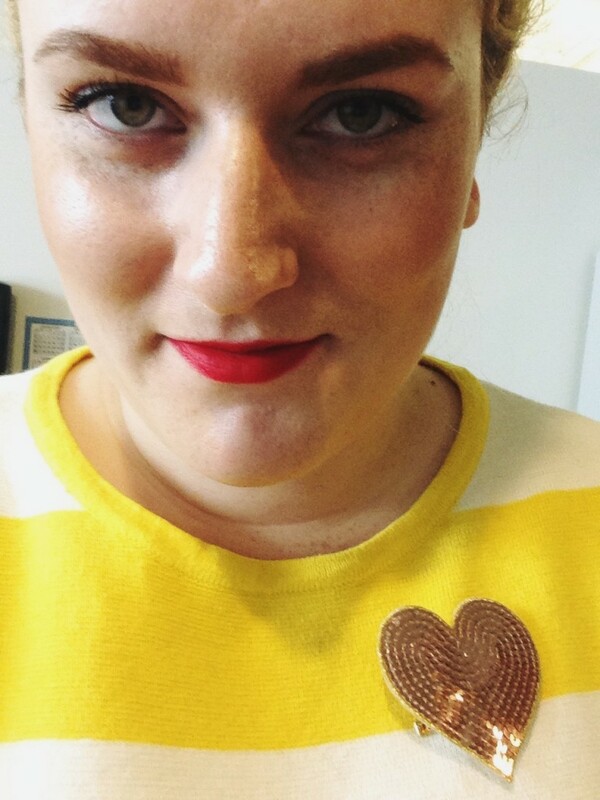 Ruby Woo; Sweater: Madewell; Heart pin: Ban.do (gift from Meghan). The city feels smaller than it is. It honestly feels like a close-knit neighborhood with a cool, hip vibe. In fact, the other day I ran into my co-worker on the sidewalk! The chances of this happening are next to none because I literally know 2 people in the city so far. I feel like it’s the kind of place where you’re on a first name basis with your barista and you sometimes hang out with them on the weekends. I can’t wait to keep learning about my new city! Life is good and exciting. Happy Sunday! It’s the end of the weekend, when all the hustle and bustle of Saturday has come and gone and all you want to do is curl up on the couch and binge-watch Netflix in your pajamas. Preferably with something delicious baking in the oven. 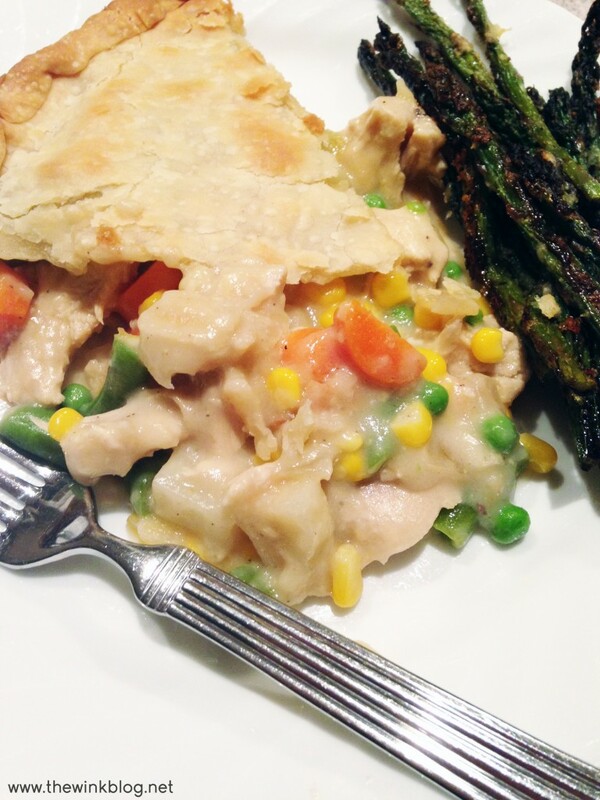 My favorite comfort food of all time is chicken pot pie. It’s so hearty and homey and has PIE in the name. I mean, come on. Do I really need to convince you further? It’s cold and wintery outside and you need something warm and delicious in your belly. Heat oven to 425°F. 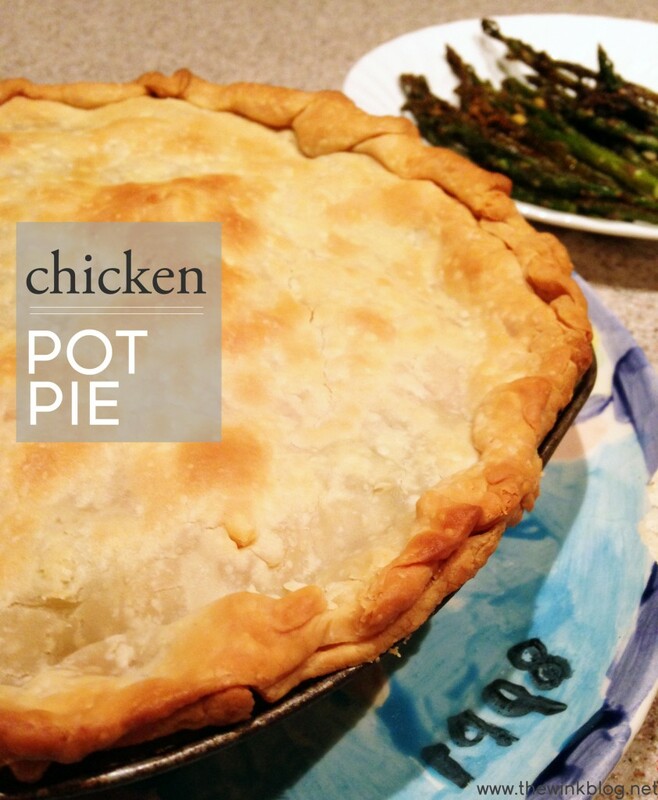 Make pie crusts as directed on box using 9-inch glass pie pan. Microwave chopped and peeled potato for 2 minutes, or until the potato is soft enough to easily pierce with a fork. Stir in chicken, mixed vegetables, and potato. Remove from heat. Spoon chicken mixture into crust-lined pan. Top with second crust; seal edge and flute. Cut slits in several places in top crust. Bake 30 to 40 minutes or until crust is golden brown. Pro tip: During last 15 to 20 minutes of baking, cover crust edge with strips of foil to prevent excessive browning. Let stand 5 minutes before serving. P.S. Meghan made this pie for me on my birthday, so it has a really special place in my heart (and stomach).